Wireless sensor monitors temperature in chilled areas--sends a signal every 30 seconds, enabling alerts and automatic recordkeeping for JCAHO and HACCP reports. 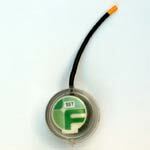 Contains a sensor that sends core or surface temperature readings to the Web every 30 seconds. Designed for steam table and pan processes, the Pan Probe monitors temperature of food, sends a signal every 30 seconds. Wireless monitor for fixed area. The Area Probe can't "walk off", it mounts to counter or wall with 36" reach. Receives signals from sensors; transmits via a PC to the Web. Allows user to view real-time temperature readings from any PC. Within range of a Freshloc reader, the logger sends real-time temperature to the Web every 30 seconds. On the road, it logs temperature data, then automatically downloads to the Web as soon as the truck returns to base. runs on Windows™ and manages the FreshLoc components. Easily configured.